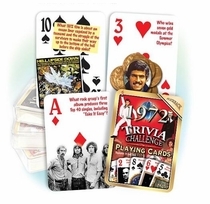 1970 Trivia Playing Cards. Did someone get their start in 1970? 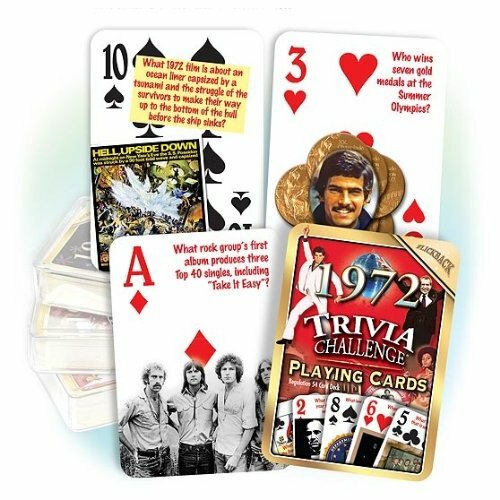 Help them remember their year with a deck of 45th birthday cards which feature an image and trivia question from 1970 on each card! Don't worry, the answers are there just on a separate card! Make turning a year older easier with this nostalgic 45th Birthday gift. Or a 45th anniversary gift as well! Here are some sample 45th anniversary cards: Felix and Oscar are characters on which television series? (The Odd Couple). What musical television family takes flight in their funky bus this year? (The Partridge Family). By working together, the White House and Congress establish which federal government agency in 1970? (the Environmental Protection Agency). Which daytime drama debuts on ABC? (All My Children). Which film based on Erich Segal's best selling novel is released this year? (Love Story). Which musical group officially disbands in 1970? (The Beatles). Which secret agent comedy series does CBS eighty-six this September? (Get Smart). Which football and baseball stadium, built where the Allegheny and Monongahela rivers joining to form the Ohio River, opens this July? (Three Rivers Stadium in Pittsburgh). See also our other 45th birthday gifts and 45th anniversary gifts.